It’s easy to subscribe to our air filter delivery service. Simply choose your filter plan, delivery frequency, and you’re good to go! Our Basic subscription option traps dust, lint, mites, pet dander, pollen, and dirt from entering your home. Our Basic subscription option is more than basic. The air filter you receive for your subscription is the most economical option, and still keeps the air in your home clean, and protects your health against common household allergens and particles. It is 20x more effective than a standard fiberglass filter found at a big box store! We recommend this plan for smaller homes or homes in areas with cleaner air. Each of our Basic subscription filters is proudly made in the United States by Flanders Corporation, the top producers of filters in the nation. We proudly distribute the filters to your home, depending on your customized air filter subscription option. On average, air passes through an air filter about twice a day. Each time, it brings in innumerable particles that are harmful to your health, and bad for your lungs. By installing a basic air filter, you can prevent these particles from entering your home, protecting yourself and your family. 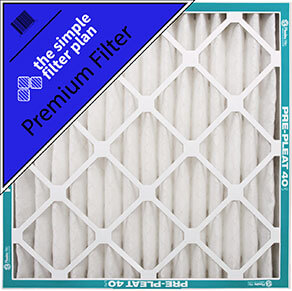 The monthly air filter delivery subscription service from Simple Filter Plan is the ideal solution to your air filter replacement needs. You won’t have to worry about remembering to replace your filter every 1-3 months. Simply subscribe to our air filter delivery service, and have your air filter delivered to your doorstep. Your home will be more energy efficient, your monthly costs will decrease, and you’ll find that our filters are highly-effective. Our Basic subscription options are most affordable, and protect your home from toxins and harmful particles. Learn more about our AC filter delivery options, and subscribe to one of our services! You’ve selected the Basic Filter. It’s a perfect option for families who want to make a healthy change while sticking to their budget. Need more filtration?